SIOUX FALLS, SD — The Sioux Falls Skyforce will proudly partner with South Dakota Corn and Feeding South Dakota to host the fifth annual Corn Week food drive and fundraiser. Corn Week will begin on Monday, November 19 and will last through Saturday’s SD Corn Association game on Saturday, November 24. The food drive will take place from 9:00 A.M. to 5:00 P.M. at the Skyforce office from Monday, November 19 through Wednesday, November 21 prior to Thanksgiving, and will continue on Friday, November 23 from 9:00AM to 3:00PM. All donations will go toward Feeding South Dakota. Upon donating food, you will receive four tickets to the SD Corn Association Game on Saturday, November 24, in which the Skyforce will take on the South Bay Lakers. Bins for food donations will also be set up at the Sanford Pentagon during the game on Saturday night as well. Those who donate food at the game on Saturday evening will be given coupons good for 50% off of all Skyforce merchandise. 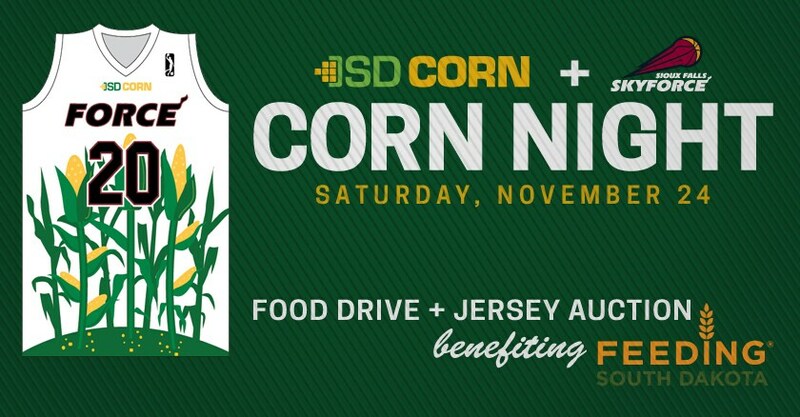 Along with food donations, fans will have the opportunity to raise money by purchasing a corn-themed jersey online. Fans may choose whether they want a specific player to sign their jersey, or the entire team. Any remaining jerseys that are not purchased online will be auctioned off at Saturday’s SD Corn Association Game. All proceeds from the jersey auction will also go to Feeding South Dakota. Each jersey sold will either provide two Sioux Falls children with a backpack full of food every weekend for an entire school year, or it will provide an entire family with food for up to 10 weeks! Over the last three seasons, Corn Week jersey auctions have raised over $34,000 and food drives have collected around 4,200 pounds of food. Last season alone, over $10,000 was raised and over 2,500 pounds of food was collected. 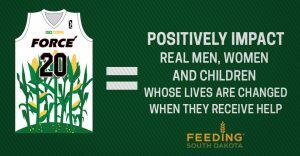 “Feeding South Dakota is once again both humbled and excited to partner with SD Corn and the Sioux Falls Skyforce again this year to raise food and funds for those who are hungry. Last year, this promotion helped to provide more than 40,000 meals for struggling individuals and families across the community,” said Matt Gassen, CEO of Feeding South Dakota.